Conference realignment is definitely confusing these days, but we're pretty sure Florida State is still in the ACC. In fact, yes, Florida State is still in the ACC; the Seminoles beat Georgia Tech 21-15 last year to win the ACC for the first time in seven years. According to this ring FSU won the SEC for the first time in ever. 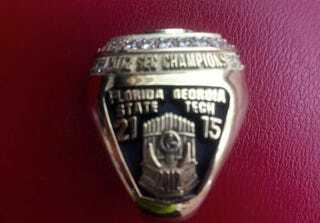 Menelik Watson, a second-round pick of the Oakland Raiders and former Seminole just tweeted a picture of the championship ring meant to commemorate Florida State's status as 2012 ACC Champions but unfortunately, it commemorates Florida State's status as 2012 SEC Champions, a claim Alabama may dispute. Update: Thanks to reader Jeff, we have evidence that suggests at least one player had the correct conference designation on his ring.